Do you think you make great tweets? Are you waiting the day you show up on a few #followfriday lists? 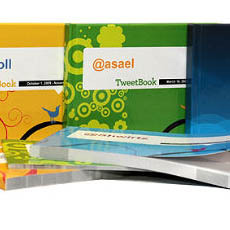 If you can’t wait to make sure your tweets are getting read by the right people, immortalize 200 of your best tweets in a cool printed book with your username and pic on the cover. Get one to keep on the coffee table and send them to all of your friends who haven’t caught on to this whole Twitter thing yet.